The Least of the Leaders? Why Was I Awake at 3:00 a.m.? How Could I Get to Church? “All human beings﻿—male and female﻿—are created in the image of God. Each is a beloved spirit son or daughter of heavenly parents, and, as such, each has a divine nature and destiny” (“The Family: A Proclamation to the World”). My life is a gift; my life has a plan. My life has a purpose; in heav’n it began. And seek for God’s light to direct me from birth. These words teach that you lived with Heavenly Father before you came to earth. You are His child. Heavenly Father asked His Son, Jesus Christ, to create the earth. The earth was prepared so you could come and receive a body. You were also given agency, and you chose to come to earth and learn to follow Heavenly Father’s plan. You can learn about Heavenly Father’s plan in the scriptures. Jacob, a Book of Mormon prophet, taught that Jesus Christ was chosen to be our Savior. He would come to earth to live, take upon Himself the sins of the world, and provide a way for all of Heavenly Father’s children to return to Him. Because of Jesus, you can repent and be forgiven of your sins. Jacob said, “O how great the plan of our God!” (2 Nephi 9:13). Heavenly Father loves you. He has given you His word﻿—the scriptures﻿—so you can learn about His plan. If you follow His plan, you will be happy on earth and return to live with Him someday. Remove page F4, and mount it on heavy paper. Cut out each shape on the solid black lines, and attach a piece of flannel or rough material to the back. Use the illustration of the completed flannel board to help you put the flannel board shapes in their correct places. 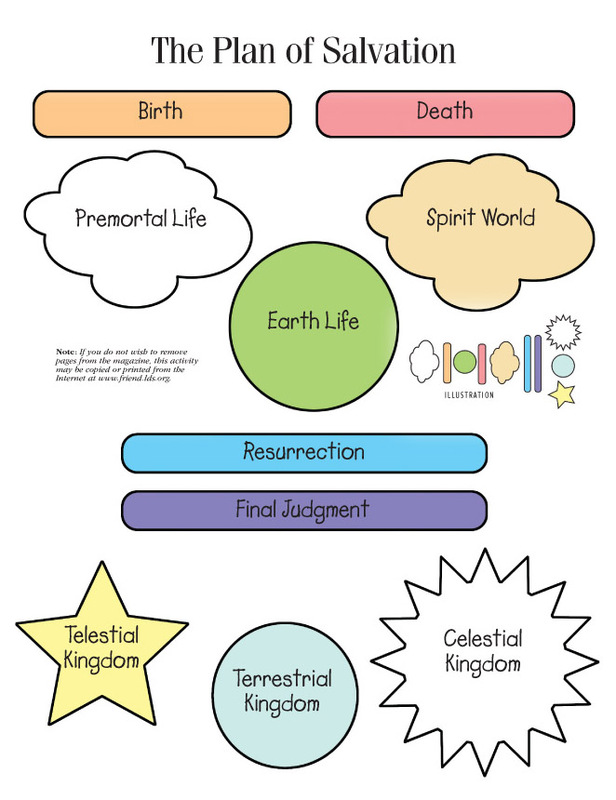 Learn about the plan of salvation, and share what you have learned with your family. Consider doing this activity for a family home evening lesson. Show a picture of the First Presidency and Quorum of the Twelve Apostles and a copy of “The Family: A Proclamation to the World” (Liahona, Oct. 2004, 49). Discuss the importance of the proclamation, and help the children memorize the first sentence of the second paragraph. Explain that being “created in the image of God” means that we have physical bodies and can become like Heavenly Father. Discuss the blessings of having a body. Refer to My Gospel Standards: “I will keep my mind and body sacred and pure, and I will not partake of things that are harmful to me.” Talk about ways to show respect for our bodies. Say, “I have a divine destiny,” and ask the children what they think that means. Discuss the meaning of the words divine (directly from God) and destiny (a predetermined plan). Read Abraham 3:23 together. Underline the phrase “thou wast chosen before thou wast born.” Share some events from Abraham’s life. Emphasize that Heavenly Father knew and loved Abraham in the premortal life. Because of his obedience, Abraham received many blessings from Heavenly Father. Share examples of others who were chosen before they were born to fulfill an important mission: Joseph Smith (see 2 Nephi 3:14–15), Gordon B. Hinckley (see “Seek Ye the Kingdom of God,” Liahona, May 2006, 82), and Jesus Christ (see Moses 4:1–2). Remind the children that Heavenly Father has an important mission for them to fulfill while they are on the earth. Ask, “What kinds of things do you think Heavenly Father wants you to do?” Bear testimony that each person has a divine destiny, and choosing the right will help fulfill it.